These maple cupcakes must be pretty spectacular. I took them to work, and they disappeared pretty quickly. Before lunch. "That was one of the best cupcakes I've ever had." "Amazing frosting. Can I have the recipe?" "Karen, I had one of your cupcakes. Oh Em Gee!" "These cupcakes make me want some bacon. They kind of taste like pancakes." This cupcake recipe is laden with maple syrup, which made it kind of fun to tell everyone that they are "sugar free." 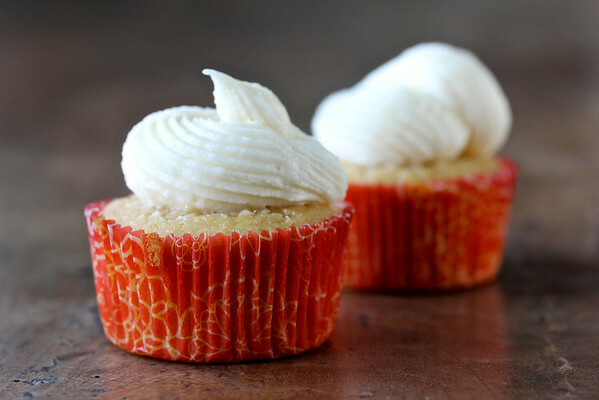 The maple syrup also gives the cupcakes an amazingly moist texture. They are unlike any other cupcake I have ever tried. Line two 12 cup cupcake pans with paper liners. In a stand mixer, beat the butter on medium high with the paddle attachment until fluffy. On low speed, slowly add the maple syrup. Beat on medium high for about 2 to 3 minutes. Add the egg yolks and egg, one at a time, until incorporated. Add half of the dry ingredient mixture and mix on low until it is mixed in. Slowly add the milk while the mixer is on, Turn the mixer off, and add the rest of the dry ingredients. Mix until just combined. Divide the batter among the 24 cupcake liners, filling them about 3/4 full. Bake the cupcakes, one pan at a time, for 20 to 25 minutes, until a toothpick comes out clean. Cool the cupcakes in the pan for 15 minutes, and then remove them from the pan and continue to cool them on a wire rack. To make the frosting, in the bowl of a stand mixer, whip the butter until smooth. Sift the sugar over the bowl (I used a strainer), add the maple syrup, and mix until smooth. You can refrigerate the frosting for up to one day, covered. Bring to room temperature before using. This recipe has been adapted from Baked Explorations by Matt Lewis and Renato Poliafito. I have all of their books. They are incredible. To see the original recipe, visit this site. Maybe a dash of bacon sprinkles next time?! :D These look fantastic! Just saw these this morning and promptly added the ingredients to my shopping list for this next weekend. Anything with maple syrup has me sold. pancake cupcakes? sign me up! i love anything maple!! Thanks Sarah! I need to bake with it more. I love anything with maple syrup. Add cupcakes that look this good to the list!! Yummy. 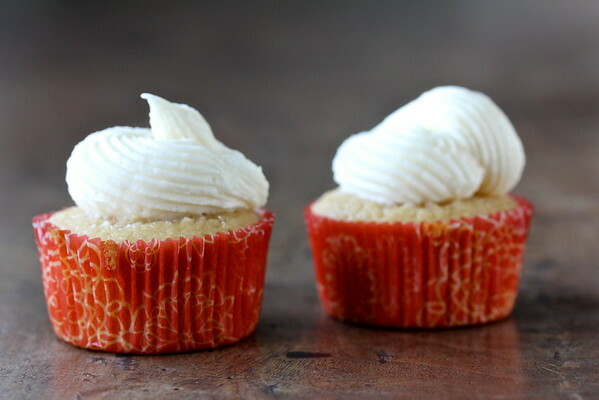 Double whammy of maple, both in the cupcake and the frosting. I love it!! I love how you're letting maple shine here! Wow! I must make these to the folks from my department, I know they would go crazy for them! love maple anything, but the combo cupcake + icing is phenomenal! I love bringing stuff to work and treating my colleagues. It sweetens up the workplace! Thanks Sally! I'll take an entire batch of the maple cream cheese frosting, please. Wow - these cupcakes sound out of this world! I'm not surprised your coworkers loved these cupcakes- they sound amazing! Cupcakes that taste like pancakes!? I'll have to give these a try ASAP! Wonderful cupcakes. I always like to bake cupcakes because of the beautiful aroma.